Anyone who has turned on ESPN at any point in the last year knows that concussions and lasting effects from concussions are a big topic in the sports world right now. Lawsuits are going on in the NFL and the NHL almost lost its best player since Gretzky, Sidney Crosby, to concussions. That is exactly why the Phoenix Coyotes Raffi Torres has been suspended by the league for 25 games for blindsiding Chicago Blackhawk Marian Hossa. Torres charged at Hossa after Hossa passed puck and slammed his elow and shoulder into Hossa’s head. 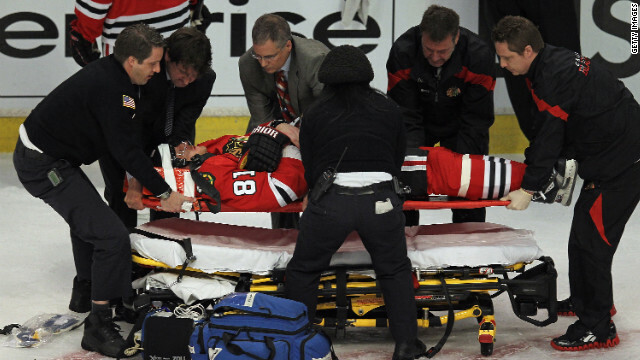 The Chicago Blackhawk forward left the game on a stretcher and is going to be out of action indefinitely. According to league official and former NHL star player Brendan Shanahan, Torres broke three separate rules with his hit including charging, interference, and committing an illegal hit to the head. Torres is also classified as a “repeat offender” by the league. Torres has already sat out one game and will not play for another 24. This includes the current playoff schedule. If the Coyotes want to make a serious run at the Stanley Cup, they are going to have to do it without Torres. Even if the Coyotes make it to the Cup Finals and go 7 games each playoff series, Torres would still not be eligible to play again until the 2012-2013 season.